This is a treat. 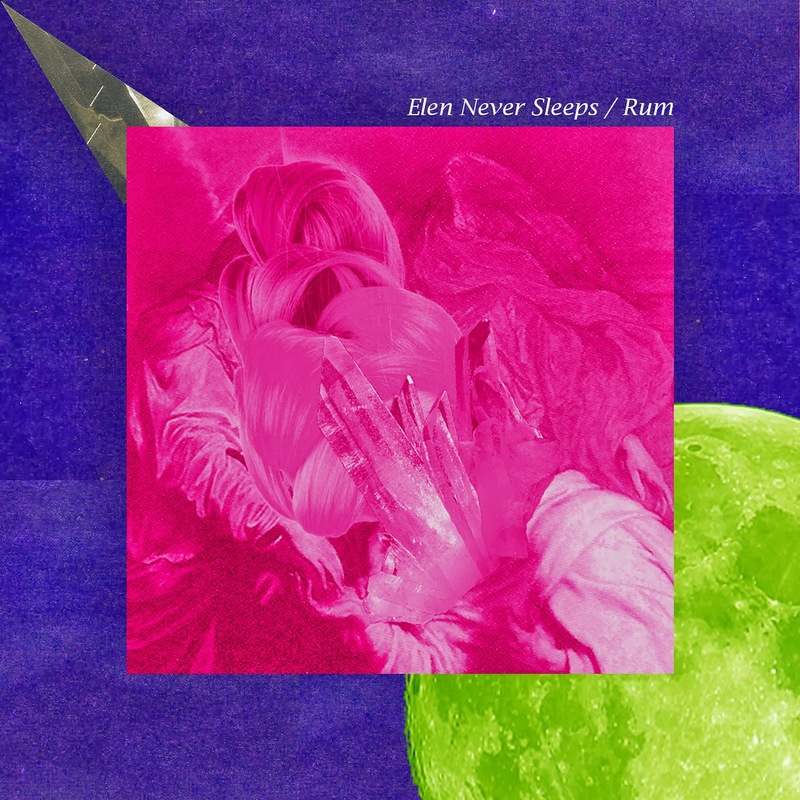 I remember reading something about Tokyo based indie singer/musician Elen Never Sleeps' SoundCloud page about his song 'Rum' being part of an EP of the same name, but I never knew when this would surface. About a month ago, ENS (as it is conveniently shortened) emailed me himself with a link to his EP - probably because I had written about the song 'Rum' a while ago. Mainly, I feel terrible that it's taken me this long to get around to writing about it. However, there is a decidedly positive undertone in my spirit as I'm listening to the Rum EP: it's really gorgeous. Awash with nostalgia, the EP is a knowing throwback to sounds of the New Romantics, yet having been created this year, it is also dreamily modern. 'Emerald' is a good example; with glassy synth chords as a constant gentle foundation to it all, ascending bass notes and super-reverbed clean guitar twiddling in the shade, it's driven by a house beat to the very end of the song. Added to this is the distinctive voice of Kaji (the only name I can attribute to the man behind the music), a crooning style that sometimes - especially in the chorus of 'Emerald' - is overcome by wild surges of emotion, trembling yelps that perfectly evoke feeling and, in its tones, inspire a nostalgic mood. Likewise, the minimalist retro drum machine beat of 'Saudade' (a title that shares its name with an untranslatable Portuguese word that is the state of feeling deep nostalgia for something/someone that you love) has a modern lilt to it. The wide synths here float over a sparse yet slow-funk bassline. Here, the vocals drift occasionally into falsetto as taiko drums boom with incidental, tropical drops of marimba loveliness now and again; this sound that leans towards feelings of melancholy in a supposed paradise (i.e. "The City") is conjured throughout. No better is this demonstrated than in the pathetic fallacy of EP closer, 'The Dark Star' – backdropped with the sound of a menacing storm complete with crashes of thunder, a drum machine beat frazzles over subdued yet disco style bassline as the vocals croon a song of loneliness. Most of the song is delightfully simple, leaving the sounds to speak for themselves, making the loudly reverb-laden chorus with its dreary storm samples rather powerful. Opener and the eponymous 'Rum' (covered in more detail here) is a great start; with its jazzy, late-night feel and catchy vocal pattern, it's certainly my favourite – the muted guitar chords, the seagull-esque sounds: all perfect. Like no other song on the EP, bouncy track 'Skyline' stays true to its title and conjures a glittering montage of a city at night: lights blinking, cars whooshing below skyscrapers. It's an upbeat 80s-indie-style tune that should inspire at least a little wiggle of your toes. The vocal harmonies in the chorus here are lovely, rich and warm, which, combined with its pop doo-doo-ing and join-in claps towards the end, makes for arguably the "happiest" song on the EP. But all in all, it's fitting that an EP about nostalgia, loneliness and love should start with rum and end in the middle of some dreadful weather. Slotting into the retroactive concept of drowning one's sorrows before taking a long walk at night, the Rum EP shines with minimalist elegance, with Elen Never Sleeps re-using some retro styles in his own unique depiction of nostalgia. Grab the EP on a name-your-price basis over at Elen Never Sleeps' Bandcamp.